Hydrex water bladders have been tried and trusted over many decades of use. Our bladders can be supplied with a re-usable crate containing carry bag, connecting hoses, pumps and accessories, making this a truly re-usable system. The water bladder can be used for potable and waste water solutions. Our membranes are certified for potable water use. Bladder sizes range from 1000 Liters through to 50000 Liters. We also offer design solutions for ships, trucks and other niche industries. Please view our water bladder data sheet for further information. The onion tank or S tank is a self-raising tank that does not require any support. It is generally used for the storage of clean or raw water. It can be rapidly filled and moved from one location to the next with minimal effort. A cover can also be supplied to prevent clean water contamination. S tank sizes range from 5000 Liters through to 30 000 Liters. Please view our S Tank data sheet for further information. Hydrex® mobile water treatment systems are trailer or skid mounted systems that mounted onto trucks. Due to the ever changing water source, the systems can be built to cater for a wide range of water impurities. Typical mobile water treatment systems have flow rates of less than 15KL per hour. The often include RO membranes in conjunction with standard filtration. Please view our mobile water treatment data sheet for further information. The Hydrex® easy tank is the perfect impromptu fire fighting tank. Rapid assembly with an inter-locking tubular frame, the easy tank offer up to 100KL water storage at very short notice. The standard clam lock couplings fallow for quick connections to fire trucks and pumps. The tank is manufactured using a heavy duty re inforced PVC based material. We offer custom crates for the storage of the tanks, pumps and lay-flat hoses. 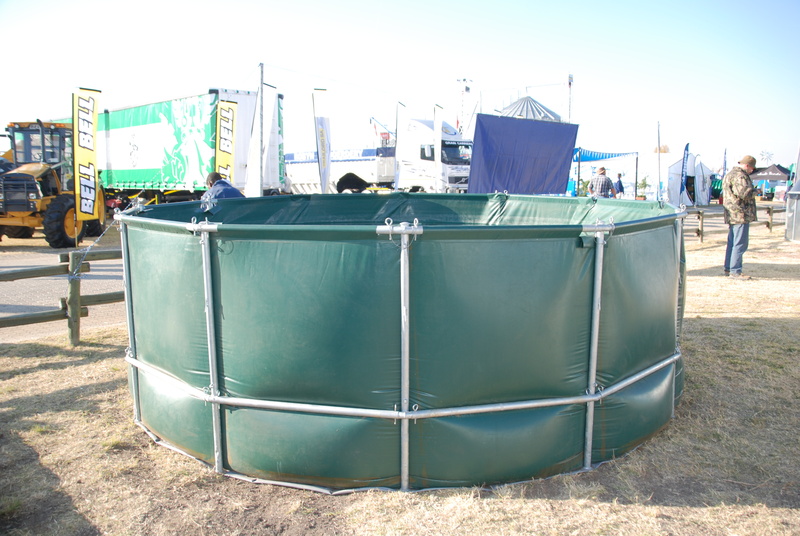 The easy tank is an ideal solution for tented camps and temporary fuel storage facilities. Please view our easy tank data sheet for further information. Please view our easy tank data sheet for further information. The Hydrex® fuel bladder range is produced from a specially formulated fuel resistant material, suitable for petrolium products. Our fuel bladders are fitted with re fuelling points, breathers, dispensing points. Water traps and drains can also be added. The general sizes are 5, 10 and 20KL systems that can be used on a stand alone or inter-connected basis. Pipe work, filtration, dispensing systems and bunding solutions form an integral part of the entire solution. We also offer custom made bladders and solutions to our clients. Please view our fuel bladder data sheet for further information.